Right off Hwy. 29 and conveniently located to many of Napa Valley’s premier wineries, this restaurant is reminiscent of lazy warm days spent in Tuscany lingering over the table, sipping wine. 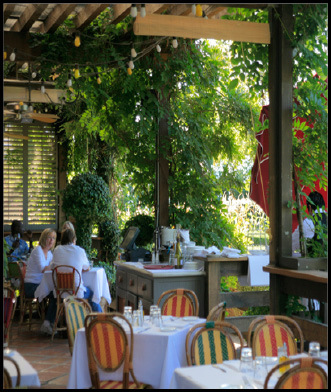 Even more so because Bistro Don Giovanni offers “Al Fresco” dining underneath a latticed portico or next to their lyrical “Commedia dell’arte” fountain across from their herb and veggie gardens separated by a massive hedge of rosemary. If fresh air is not your thing or the weather is unfavorable, you can always step through the French doors to the main dining room with small bar that opens up into a lovely room with booths and tables. This is a very attractive restaurant; inside and out. I have had lunch here several times and always thought it was an attractive restaurant with good food. On this recent visit I was entertaining a client who has a summer home in Napa and rates Don Giovanni as her favorite Wine Country restaurant. So I decided to plunge into the menu and explore dishes with gusto. Given our festive mood, I ordered a bottle of Rombauer Chardonnay, one of my favorite wines. Sipping our wine and nibbling on the complimentary house-made focaccia with rosemary, my client recommended the Bruschetta ($8 **) Nicely toasted slices of french bread topped with tomatoes, garlic and basil. Good. Antipasti for me, Beet and Haricots Verts Salad ($11 ****) avocado-fennel salad with Roquefort Vinaigrette. I am always up for roasted beets. This one was beautiful to look at and dressed just right. Done with the Antipasti course, it was time to check out their pizzas! Margherita, ($14 ****) tomato, basil, Mozzarella. Such a simple pizza that can go so wrong and does, if not prepared properly. No worries here. Simply wonderful with a thin crust and just enough tomato and cheese. Needless to say I took half home to hubby! Secondi course. Seared Salmon Filet ($26***) with buttermilk mashed potatoes, tomato-chive butter and the day’s special, Halibut with Artichokes, Mashed Potatoes and Bagna Cauda Sauce ($26***). Both dishes were cooked perfectly. The salmon had a pink center and the halibut was flaky and moist with crispy skins. 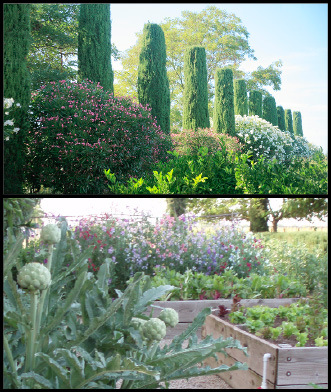 The artichokes used came from the restaurant’s ample garden and were delicious with a bit of their stems left on. For those unfamiliar with the Italian sauce Bagna Cauda, it is made by combining olive oil, chopped anchovies, garlic and lots and lots of butter cooked over semi high heat and used as a dip or drizzled over meat or fish. It is the Italians’ answer to the Japanese taste of Umami. A great flavor addition. Dolce was a Blueberry Gelato ($6***), refreshing with real fruit and a cookie. A perfect ending. I highly recommend this restaurant. Staff is warm and friendly. Wine Notes: All the usual suspects from Wine Country and beyond, with two estate grown wines from the owners’ one-acre vineyard at their family home in Napa Valley. A Cabernet Sauvignon and Scalavesse, (an aged and balanced Sangiovese). Great food, great atmosphere, hold on tight to your cell phone—it may go missing!